Des is about to reveal to Harold his new business partner. 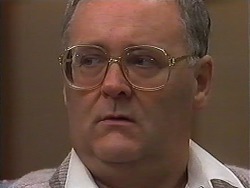 Harold is in the kitchen waiting and Des opens the front door and Madge enters shouting ‘surprise'. Harold is pleased, but not quite so when he hears that the money has come from mortgaging the house. However, Des and Madge convince him that it's a sound investment and Harold is very pleased. 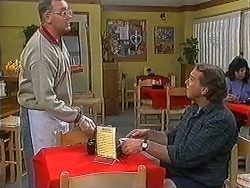 Roger comes to take Melanie for lunch but Paul stops them to make sure that Melanie has everything straight before he heads off on his trip. Melanie assures him she can run things on her own but Paul reminds her that he doesn't want her to run things, just to take messages and get in touch if anything big comes up. Although jealous, Melanie wishes them a good time and Caroline and Chrissie promise to bring a souvenir for her from the Gold Coast. Harold is delighted about Madge being his new partner. He's looking forward to not having to run to Des every time he wants to change something and that he has some changes in mind which will hopefully increase profit so that they can start to pay off the mortgage. Harold tells Madge that she's got nothing to worry about; he'll take care of everything. However, Madge doesn't like the sound of this and reminds him that they are partners. Harold had assumed that she was going to sign management over to him, as she has the Waterhole to run as well but that doesn't seem to be the case! Madge intends to pull her weight. That's a shame for Harold, who assumed she was going to be a silent partner. 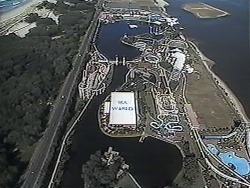 Paul, Chrissie and Caroline are clearly travelling by helicopter and we get a nice view of the Gold Coast. They land and get into a car – they're very excited and want to hit the beach, however Paul tells them they've got a few things to sort out at the hotel first. 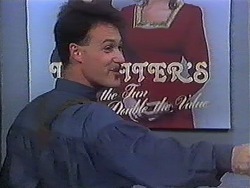 Paul introduces himself to a man he spoke on the phone who is hanging up a promotional picture of Lassiter's featuring Caroline and Chrissie with the words “Double the fun. Double the value”. Chrissie loves it but Caroline isn't impressed. Paul says it was just a last minute idea but Caroline points out that he still had time to get it printed. Paul says it'll give them the edge they need and he didn't think they'd mind. Melanie is making herself at home. She finds the Dictaphone and records on it, pretending to be in charge. She pretends to be talking to Paul, getting him to write a letter. She doesn't realise that Madge is listening in, who has come to ask for the float for the Waterhole. Madge is surprised that Paul left Melanie in charge, she says that she's jealous everyone else is sunning themselves ad she's in the office, but it's dirty work and someone has to do it. Caroline is still annoyed at Paul – the posters are clearly exploitation! She agrees though that she will help advertise Lassiter's. Paul mentions that there might be some press about too, and Caroline is unsure, whereas Chrissie is rather excited. Chrissie tries to talk Caroline into it, telling her that it could be good fun. Doug comes in and Harold speaks with him. He realises that Doug is Cody's father and goes on to apologise about the other day, he thought he was someone else. He explains about how he was trying to put him off from buying Des' half. Harold gives him a free cup of coffee by way of an apology. Doug wonders if Harold has thought anymore about those extensions he was talking about and Harold simply says “we'll see”. Roger has come to ask Melanie if she can meet him after work. Melanie thinks that she should stay back, but in her position she can set her own schedule. Madge comes in again and asks Melanie for a list of stock orders. Melanie finds them and hands them over. Madge introduces herself to Roger and asks about the big day. Melanie says they want a spring wedding, so hopefully it'll be in a couple of months and then they'll honeymoon in Paris and then move to New Zealand. Madge is happy for them. Melanie says she wants lots of kids and Roger already has two, which she knows that she's going to get along with very well. Roger looks a bit unsure! Chrissie and Caroline say goodbye to the last lot of interested people and comment that they want to go for lunch. But, no such luck! Paul wants them to model for some more photos. Caroline isn't happy. Paul has bought them a present – bikinis. He wants the girls to wear them for the photos. After a lot of persuading, Caroline comes to a deal. If they're to work as models they want to be paid like models and he has to wear a swimsuit too – after all participation by the management is a good thing! A bit later (after the break, in fact) the girls are modelling. Caroline goes to get Paul who poses with the girls. Madge wants to have a look at the books. Harold mentions to Madge that Doug Willis was in earlier and he had some ideas about renovations. Madge tells him not to do anymore considering without her. Roger and Melanie walk in. 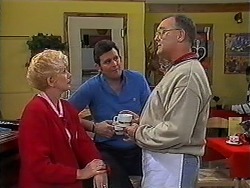 Madge tells Harold that the man is Roger and how she thinks Roger is too old for Melanie. Harold tells her it's a matter of taste, and as long as they are both happy that's all that matters. Roger and Melanie are talking. Roger admits he hasn't thought much about having any more kids – his two are enough. He explains that they aren't happy living with their mum and stepfather-to-be and have asked if they can live with him. Melanie thinks it's fantastic – an instant family! She asks what Roger's kids think about the two of them and he admits that he hasn't had a chance to talk to them properly about everything yet. But he's arranged for his daughter to come and meet Melanie – now. We watch Paul dive in to the pool and swim. I have to say it looks gorgeous! The weather and surroundings that is, not Paul. The two girls get into the Jacuzzi. 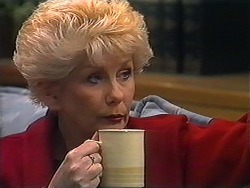 Chrissie tells Caroline that she could get used to modelling but Caroline replies that she'd rather stick to management. Paul joins them. The girls ask him to get them another cocktail. After all, Paul did promise them a great holiday in return for the modelling favour they did. Paul goes to get them one. Harold asks Melanie and Roger if they'll be much longer, presumably because they're closing shortly. Roger explains that they're waiting for his daughter and Melanie asks for another coffee. 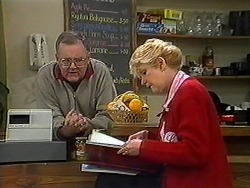 Madge butts in though and says that she can, she then tells Harold that it pays to keep the regular customers on side. Tanya comes in and Melanie is shocked – she knows her! Tanya doesn't think Roger can be serious! Not only is she too young for him but she's too weird!